Fresh, light and very delicious...I would definitely go for a 2nd helping! That salad looks delicious,perfect for the hot weather here!My favorite salad is tomatoes and japanese cucumber one.Happy Easter,dear Jean! Thanks, Angie. I'm having a second helping today! Sully, I'm glad to see salads are creeping onto your menu. You could use clementines in place of the tomatoes, but I don't like them together. This would be fine with cheese, but clementines and cheese would be a bad combo for my tastebuds. Yummmm!!! I've been craving salads lately, and looking forward to once again having some fresh greens in the veggie garden. This looks great! Thanks, Debbie. I go for a long time without a salad, then I start craving them! And my days of making salads AND dinner are over! So I like to make a salad that IS dinner. This sounds delicious and I have everything on hand to make it! Thank you for sharing! Debbie, thank you. Don't you love it when that happens! Because some days I'm just NOT going to run out to the store! Very much into salads over here Jean. I must admit I like Jersey Royals with butter and sea salt to go with the lettuce, tomatoes, chickpeas, peppers etc. But quinoa? Is that a sort of opium as in poppy seeds etc? Quite a salad experience I should think. If you like a bit of European World War II history, Jersey Royals, had a sad moment when Jersey was taken over by the Germans. Jersey had a very bad war.British people have a great fondness and a place in their hearts for Jersey and their special potatoes partly as a consequence but also because they have an amazing flavour. Zaa, thank you! Mr Delightful loved it, and I hope your husband will too. All the best to you both. Tony, I have many ways with potatoes, salads or otherwise - *love* potatoes and would love to try Jersey Royals someday. It was only when Island at War came out that I learned of Jersey's wartime experience, and I was angry that I had never heard of it before. Why was it not in the history books? How did I get to this age without hearing about it? Anyway ... thanks for that bit of history. If I hadn't been enlightened as I mentioned, it would have been news to me. 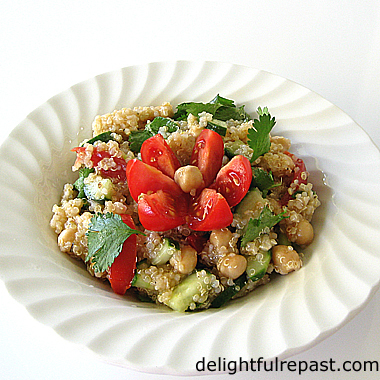 I like quinoa and chickpeas so this easy salad is perfect for me! Thanks for sharing! This one looks very nice indeed. Thanks, Margie. I had made enough for three main, so had the leftovers for lunch today. Liked it even better today! Jan, thank you. It IS time for salads! Very nice salad. I usually have quinoa in the cupboard, but I usually forget to use it. My ideal salad is simply tomatoes that have just been picked on a warm, summer day with a simple dressing and maybe a little basil. At this time of year, though, my salads tend to feature quite a lot of celeriac. 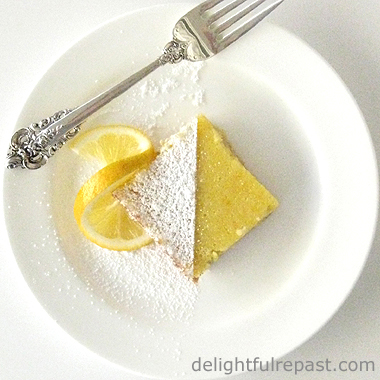 Delicious and perfect for spring! Thanks, Phil. And I quite agree - I love raw celeriac, and nothing can top tomatoes fresh from the garden on a warm summer day. Diana, thank you. And Happy Spring! Manu, thank you. And hugs! What a beautiful presentation you've shared, Jean! 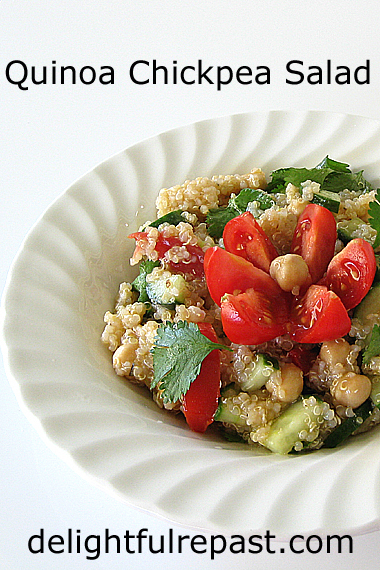 The chickpeas and quinoa sound like the perfect combo for a salad. Happy Easter, Jean! Kitty, thank you so much! It's a good protein salad. Enjoy your special family time! Thank you for the reminder to dig out the quinoa - I love that it makes the salad a little more hearty. I think, Jean, I'll use your recipe as a jumping off point and possibly throw in a bit of chicken and mango too. A little fruit in a salad always raises my enthusiasm! Pauline, chicken and mango would be great - this is very versatile. I just don't like to mix in other fruits with tomatoes. Thanks, Jeanie. Yes, I've made many variations - go ahead and throw the kitchen sink at it! Hi Jean! Yum! That is pretty! It looks very tasty, too! I like mushrooms in my salad. I love olives, too. Karen, thank you. I like mushrooms and olives, too! Hi Jean, Thank you for this healthy recipe. John is diabetic and I am always searching for high protein meals with no sugar. We both would love this. I do love tomatoes on my salad and John loves mushrooms. We appreciate your kind comment re John's illness. Wishing you a most blessed Easter. This looks like a delicious meal and healthy salad. Thanks for sharing. Happy weekend, Happy Easter to you and your family. We both love chickpeas and quinoa, but have never combined them. Like you, we are looking to eat simply and healthfully several nights a week. This seems to happen more often than not; I have an upcoming blog post for a quinoa salad as well. Happily it’s very different from yours! I am always amazed at how we crave so much on the same wavelength! Oh, and my favorite salad ingredient is avocado. Happy Day of the Blue Moon! Mildred, thank you. I do hope this will be a good low-glycemic choice for John. And throw some mushrooms on there. They would fit well with the other ingredients. Thanks, Eileen! Hope you have a wonderful weekend. Thanks, David. Yes, these "wavelengths" are a funny thing! And throw some avocado in there. It would go well with the other ingredients. I was going to do that this time, but I had my heart set on using my last big, perfect avocado for a solo lunch of guacamole and organic white corn chips! Can never eat guacamole out because, as you know, it always has garlic. Oh, this looks delish! Pinned! Thanks, Amy. Pins and all social media shares are always much appreciated! thanks for the recipe and the suggestion on DIY variations. My daughter and her daughter [my granddaughter] are vegans. their visits are sometimes a culinary challenge.this is just perfect for a spring or summer visit. Thank you, grownchildren. I'm so glad it was helpful. And if you have any gluten-free people visiting, I have developed lots of GF recipes. Everyone I know has a different set of eating restrictions, so it does get challenging! My sister makes a salad similar to this and it is so good. I will have to give yours a try when she comes to visit. Thank you, Victoria. I hope you'll both like it! What a lovely fresh, flavourful and colourful salad, Jean! I never used to eat chickpeas and now they are a real favourite. 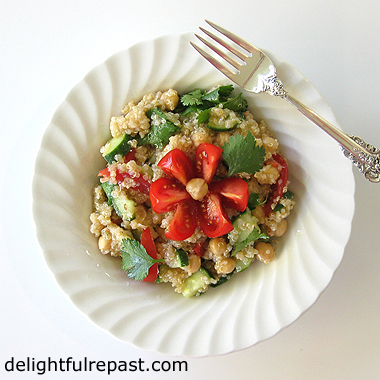 Thank you so much for sharing your Quinoa Chickpea Salad at the Hearth and Soul Link Party! Happy Easter to you and yours. This sounds very good....will have to give it a try. Maybe tonight! Thank you, April. And I love that it can be made a day ahead! Chickpeas are catching on! Thank you, Unknown. Do let me know how it turns out for you. That is so pretty. I've never combined chickpeas and quinoa. I love the unusual and yet it really isn't. You have your protein in the chickpeas and quinoa and the extra flavor you put into it would certainly make it a favorite in our house. Brava!! Marisa, thanks so much. We love olive oil and wine vinegar, and if I had put olives in this, Mr Delightful would've been super happy. Thanks, Dawn. I think it's a great combination. Hope you'll try it soon. What a beautiful salad! Thanks for sharing with us at the To Grandma's house we go link party! Tarah, thank you! Love your link party. I'm trying really heard to like quinoa. :) I know that it is so good for you. I think it's something to do with the texture. Thanks for sharing this recipe with SYC. Jann, you don't have to like quinoa! :D I figure if I've tried something a few times and don't like it, I'll just have to get along without it! Love main course salads like this! And we're in the midst of switching from having soup at least twice a week for dinner, to having salad at least twice a week for dinner. So I can use more terrific recipes like this. Thanks! John, thank you! And what a terrific idea to have soup dinners twice a week part of the year and salad dinners the other part - I think I'm going to adopt that plan! Thanks, Lucy! I plan to eat more salads over the summer.